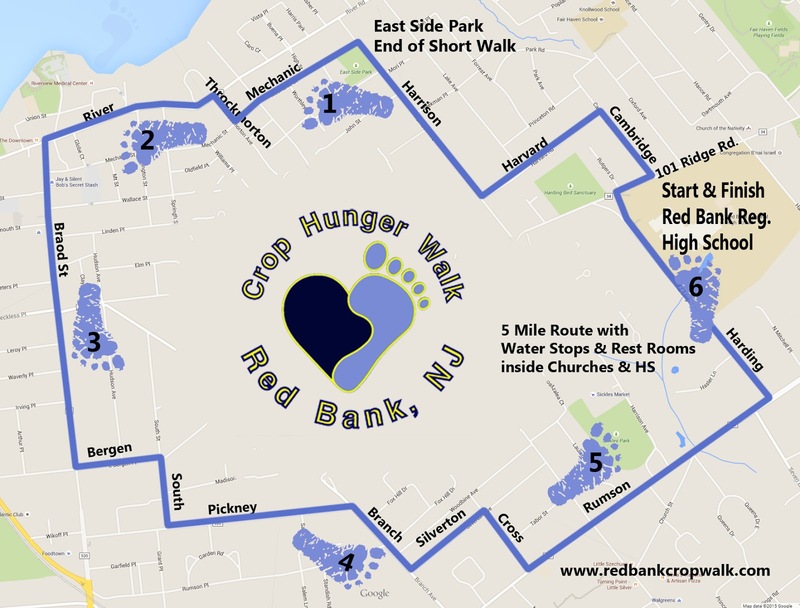 Red Bank CROP Walkers have always used their Hearts and Soles to raise funds to help hungry neighbors near and far. Walk with your friends, make new friends, enjoy the walk knowing you are out there helping your neighbors in need to have a better life today and hope for the future! 1. 5 mile walk, level, and mostly on sidewalks. 2. 5 water stops along the route and at the finish. 5. Short walk ends at East Side Park. * Crossing guards and safety monitors along the way! * Complete sponsor forms ahead of time. * Still time to get additional sponsors. WEATHER We walk rain or shine! We've had sunshine 36 of 37 years. Check Facebook and Twitter for weather updates! PARKING Parking to the right of the entrance. Carpool to save gas! * Buy a 2018 CROP Walk t-shirt, wristbands! * Wear your church/school clothing with logos. * Bring church or school banners. * Carry CROP Walk signs, posters, banners. * Decorate strollers and wagons! Join the Stroller Brigade! * Table will be set up outside in front of Art Contest Area. * Hand in the entire sponsor envelope if you have collected all the money. * If you are still collecting, keep the donor sheet and hand in your money. LIVE MUSIC "The Wag Band" will play again, donating their time through Musicians on a Mission. Hand in sponsor forms in the registration area.Then drop off banners & posters at the Art Contest area in front of the school. Artwork will be displayed outside on the windows, weather permitting. A LITTLE FUN Short Stop the Clown and Cookie Monster. Look for him wearing this year's orange walk t-shirt. Cookie Monster and Short Stop will be happy to pose with kids and family groups for a photo op. Short Stop will be doing warm-ups about 1:40. Short Stop will also be on hand to cheer you along the route in Red Bank. HOP SCOTCH for CROP! Hop Scotch to help end hunger! * Bring a one gallon jug of water and we will provide stickers to decorate! SAFETY FIRST - Garden State Radio, town police and volunteer safety guards. * Please stay on the sidewalks and pay attention to the crossing guards. Farmers Against Hunger Information on gleaning project. Empty Bowls Program Local artists create bowls to sell. Profits go to CROP. * Runners start out first followed by walkers and the Stroller Brigade. * Don't forget your walk certificate at the finish line. * Apples, and ice cream generously provided by Superfoodtown of Red Bank, Delicious Orchards, and Sickles Market. Please use garbage cans! Our volunteers don't leave until the area is cleaned up. We will have photographers along the route. Wear your CROP Walk t-shirt from this year or any of our "Heart & Sole" t-shirts. If you don't have one wear church or school logo clothing!